When I think of Christmas cookies, a few favorites come to mind. The peanut butter cookie, snowball cookies, colorful cut sugar cookies, and chocolate chip cookies. I wanted to try something new this year in addition to my old favorites. The combination of chocolate and mint flavors in these Christmas Tree Thumbprints is divine and the cookie looks perfectly festive. Last night I brought them to a cookie exchange, and dare I say that they were my favorite out of all the cookies. As far as consistency I’d say they are part cookie park brownie, and totally sinful. I was surprised to hear Emma tell me she loved them too, so we’ll be making another batch soon. And hopefully I’ll perfect my drizzling skills. 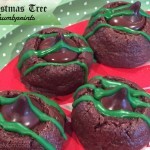 Delicious mint chocolate cookies in a festive Christmas tree shape. Beat butter, sugar, egg, milk and vanilla in mixing bowl until well combined. In a separate bowl, combine flour, cocoa and salt. Add the flour mixture to the mixer, a little at a time until combined. Chill in the refrigerator until ready to handle without being too sticky. Once ready to handle, preheat oven to 350 degrees. Roll dough into balls about 1 inch in size or slightly smaller and space out evenly onto a cookie sheet lined with a silpat or parchment paper. Gently press your thumb into the center of each ball. Place the cookie sheet into the oven for about 9-10 minutes. While waiting for the cookies to bake, unwrap the kisses. Remove cookies from the oven and let cool for 2 minutes before moving from the cookie sheet onto a sheet of wax paper. Gently press a kiss into the center of each cookie and let cool. Add peppermint extract to the icing container. Warm as directed on the bottle, microwaving for 30 seconds and 50% power. Shake icing, and carefully drizzle onto the cookies. Let the drizzle dry completely, about an hour before stacking cookies. Egg yolk is not listed in ingredients. But I see it mentioned in the directions. How many egg yolks & could you use the whole egg? 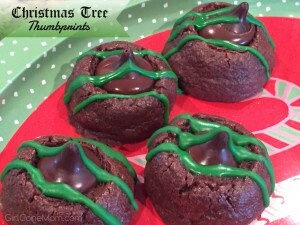 These look so festive and sound really delicious!! Such an adorably festive little cookie! 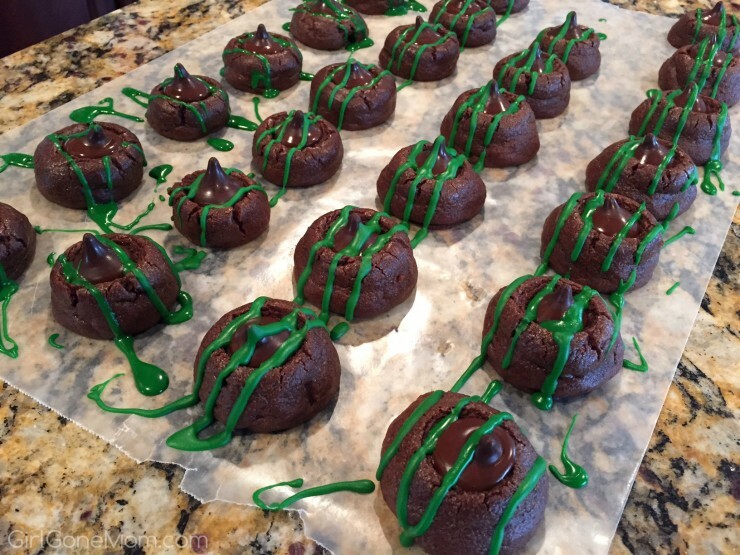 Cute idea – I like the idea of the green against the chocolately brown to make a nice contrast.